Not even the zombie apocalypse is going to stop the fun-loving members of the School Living Club from hanging out and enjoying their youthful days! Yuki Takeya loves school! She has supportive friends, a great teacher (even if she gives too much homework) and a fun club to keep her going during her school days. As a member of the School Living Club with her friends Kurumi (she loves shovels! ), club president Yuuri (she’s mature!) and her beloved teacher Megu-nee (call her Sakura-sensei! ), Yuki has her hands full keeping up with all the excitement. However, the world outside of Yuki’s delusions is much, much darker, and the other members of the School Living Club have their hands full surviving the zombie apocalypse while living at school. If you’re a fan of the “cute girls doing cute things” genre, you’ll feel right at home here but if you’re looking for a story in that genre but want a little more, you should be reading this series. You’d be forgiven for buckling in for your typical moe slice of life series while reading Yuki’s cheerful introduction to her school that forms the bulk of School-Live!’s first chapter. The chapter culminates in Yuki walking into a barren and destroyed classroom, breaking the illusion in a moment of striking contrast and revealing she is actually stuck right in the middle of the zombie apocalypse whether she knows it or not. 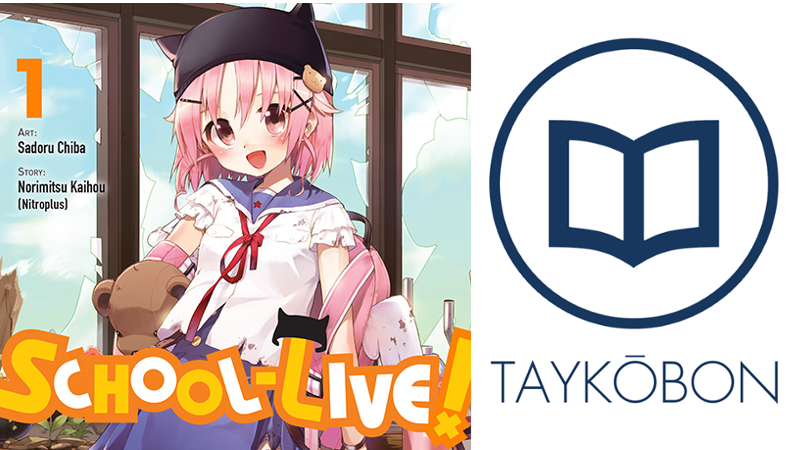 At its core, the first volume of School-Live! succeeds because of the incredible dissonance it fosters and makes effective use of to create an unsettling experience. On one hand, this is the incredibly upbeat story of the girls who form the School Living Club, on the other hand this is a story of desperate survival - and the uneasy blend of these two dynamics give School-Live! a captivating dynamic that is engaging precisely because of the sinister undercurrent it maintains throughout. Fortunately for the club, Yuki’s friends Kurumi and Yuuri are not detached from their situation in the same way, and their struggle to keep alive while carefully maintaining Yuki’s fragile delusions forms the bulk of this volume’s plot. As such, they work to maintain an atmosphere of cheerfulness that clashes directly with the horrifying nature of their predicament. I really enjoyed the way the volume slowly revealed more and more of an objective view of their situation, striping away Yuki’s narration at key moments to punctuate the surprisingly horrifying nature of this story. One of the most striking parts of this volume is how well Yuki’s unreliable narration is used to create this unsettling dissonance. For example, Yuki excitedly spots baseball players running inside from the rain, foreshadowing a darker turn later in the chapter when Kurumi is forced to defend herself again the “baseball players” turned zombies. This also brings puts Yuki’s delusions into greater perspective, as it is quickly revealed that her friends each have their own struggles but put them aside for Yuki’s sake. School-Live!’s art is perhaps the most important way by which it contrasts the bubbly nature of the proceeding with the reality of the apocalyptic situation facing these girls. The art is detailed, perfectly nailing a cute and bubbly aesthetic thanks to how much cheerful expression is conveyed through the characters. This creates a very visible contrast when the world seen from Yuki’s perspective is compared to the actual world, tearing away Yuki’s blindness to show reality in several fantastically grim and detailed impact panels that hit home perfectly. While some of the action scenes don’t hold up nearly so well due to clutter, overall the art nails the atmosphere of the story thanks to how well it conveys the sinister undercurrent to Yuki’s world. School-Live! Vol. 1 is a compelling divergence from the usual “cute girls doing cute things” genre, showing a good degree of substance due to how well it contrasts the delusions of its main character’s perspective with the reality of the destroyed world this story portrays. The art helps cement this contrast, conveying the characters’ emotions well as well as creating a properly horrifying setting when Yuki’s optimistic illusion is broken. The “moe” aesthetic might not be for everyone, but School-Live! Vol. 1 is a great place to start for anyone looking for a different take on the genre. School-Live! Vol. 1 was published by Yen Press on November 17th, 2015. Illustrated by Sadoru Chiba based on the story by Norimitsu Kaihou, the series is currently ongoing and published by Houbunsha’s Manga Time Kiraira Forward. Volume 2 will be published in English on February 23rd, 2016.